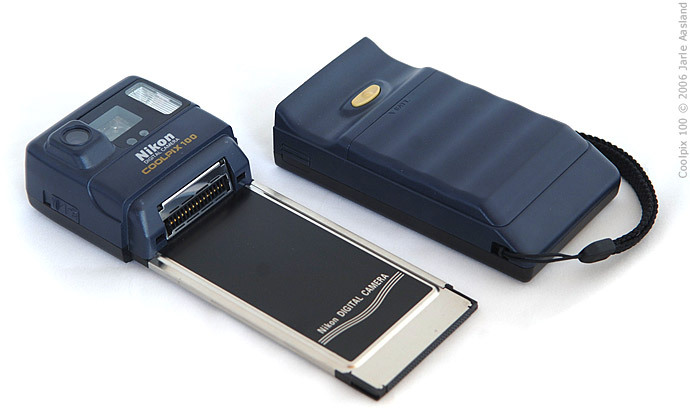 The 0.3 megapixel Coolpix 100 was announced in 1996, being Nikon's first consumer digital camera. According to a product review in PC Pro magazine, the camera cost £516 - almost $1000 - (incl. VAT) in October 1997. I paid $44 for mine on eBay in September 2006 (shipping included)..
«The first digital cameras for the consumer-level market that worked with a home computer via a serial cable were the Apple QuickTake 100 camera (February 17, 1994), the Kodak DC40 camera (March 28, 1995), the Casio QV-11 (with LCD monitor, late 1995), and Sony's Cyber-Shot Digital Still Camera (1996)». 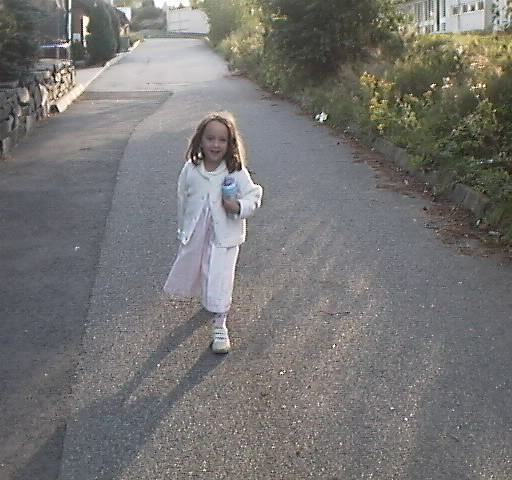 It's amazing to think this was less than ten years ago! 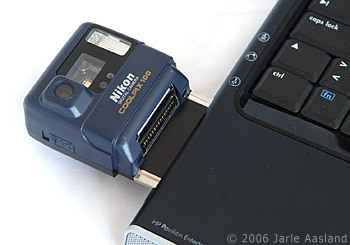 The somewhat odd looking camera is built around a PCMCIA card that can be inserted directly into most laptop computers. No need for a card reader or cable. As you can imagine, the camera is very simple to operate. Just insert 4 standard AA batteries (thank you Nikon), switch it on, point and shoot. On top of the camera there's a small LCD display showing the current date, flash mode, number of remaining shots and selected image quality (Fine or Normal). In additon to those settings, you can also switch to Macro mode using a button on the side of the camera. Shooting in Fine mode, the camera will hold 19 photos, while the number increases to 37 when you swith to Normal. A Fine JPEG is 512x480 pixels, at around 47 KB. 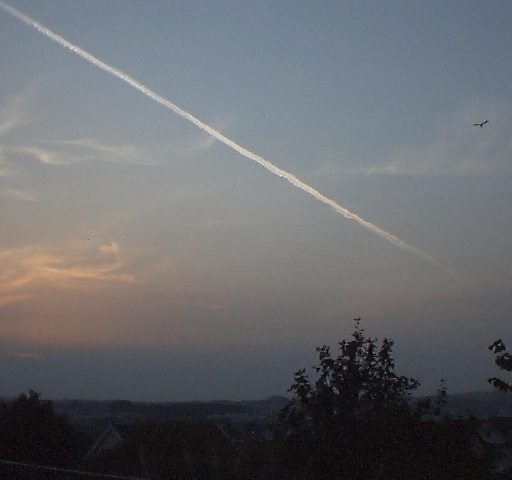 For comparison, my current Sony Ericsson cellphone (k750i) will produce 1632x1224 pixel JPEG's with sizes up to approx. 300 KB. The phone also includes a nice color monitor allowing me to review the photos. 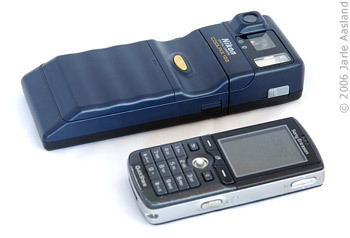 The Coolpix 100, like all the early digital cameras, does not have such a thing. 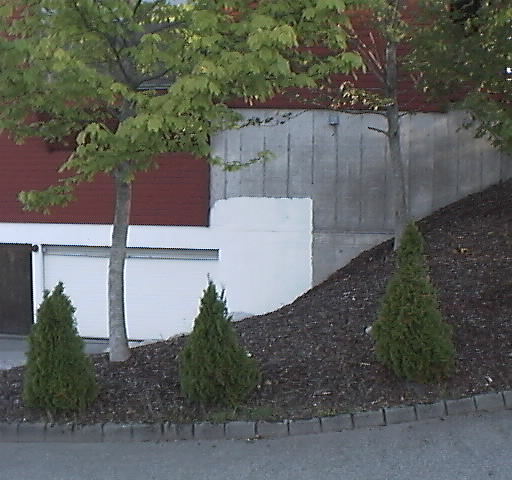 (© 2006 Jarle Aasland. Please do not distribute or use any photos on this site without prior permission). 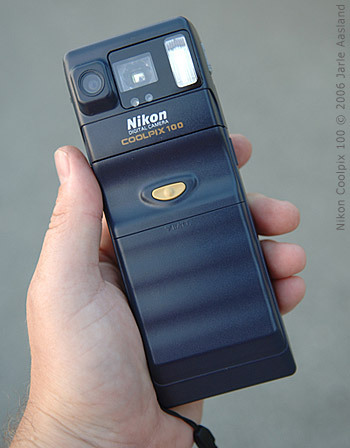 The Coolpix 100 was Nikon's first consumer digital camera, and the first in a series of popular Coolpix models, including the classic Coolpix 950 and 990. In addition to my Coolpix 100, I also have a Coolpix 800 and 990, both costing a small fortune when I bought them new.. Click on the link below to see Nikon's list of Coolpix models. Conclusion: The Coolpix 100 is a fun camera to play with for an hour or two, but like most of my early digital cameras it won't see much use. Still, it's a cool addition to any collection. After all - it is Nikon's first digital consumer model.